Aiden’s been getting more active and learning more and more. He’s taking about 2 – 3 steps on this own, learning to fall or sometimes just falling, he got 2 cuts on his lips in less than 24 hours by eating our wood floors. He’s also starting to learn some pretty cool things and will do them when he feels like it, like Arimunding-munding (a filipino dance we refer to when babies twist their hands), kissing family members, and raising the roof. Check out the video below. 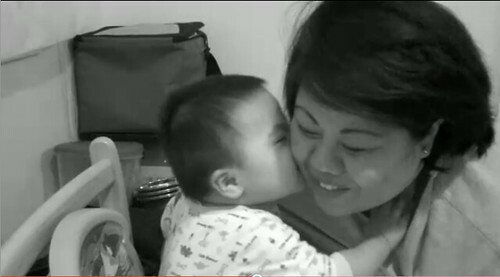 I’ve also included the link to 3 other videos of him eating bread, his crazy Tita Marissa trying to get him to Arimunding-munding, and giving kisses to mama. Click on the picture below and enjoy them on your spare time!